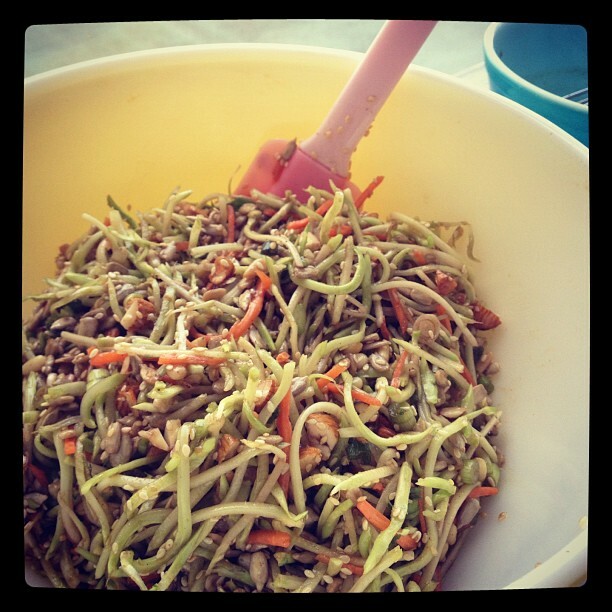 This salad is an absolute favorite from my friend Alma. I’m not sure where it originated but we have enjoyed it many times at her house. Not only is it a quick salad to put together but you likely have many of the ingredients on hand. As much as I love this salad, many of the original ingredients in this recipe are not items I would buy at the store, so the version you see here is healthier but just as crunchy and delicious as the original. How did I perform this miraculous feat? For starters, I used less oil and substituted agave (honey, maple syrup, or a date syrup could be used as well) for processed sugar. The original also called for ramen noodles. Now, I can’t tell you how many times I’ve enjoyed a bowl package of ramen in my past, but times have changed and I’ve set aside that love of packaged and processed salty fat for healthier natural versions of the same. To replace the ramen seasoning packets, I used bragg liquid aminos, poultry seasonings as well as garlic and onion powders to achieve the same flavorful blend. 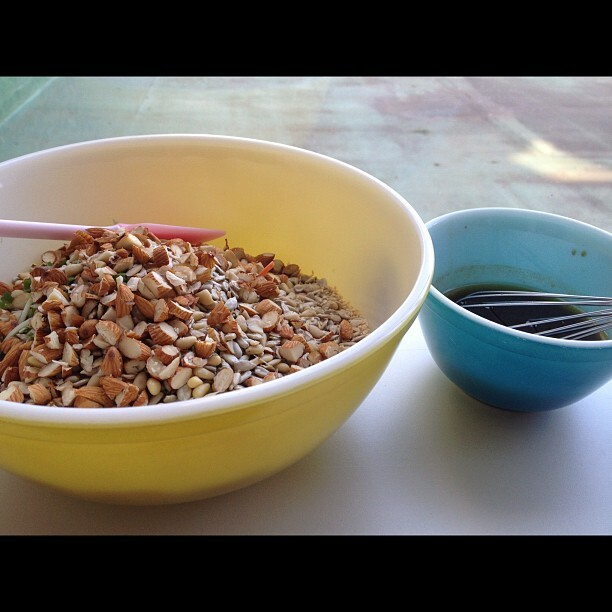 I also left out the fatty coated ramen noodles in favor of nuts and seeds. If you want to go lighter on the nuts, skip the pine nuts and almonds and instead replace them with more crunchy vegetables like celery, carrots, bok choy, bean sprouts, or even cucumber. Feel free to make your own slaw too, it’s as simple as shredding broccoli stalks and carrots. Combine olive oil, balsamic vinegar, Bragg liquid aminos, onion powder, garlic powder, and poultry seasoning in a small bowl and whisk until combined. Set aside. Empty package of broccoli slaw into a large bowl along with finely chopped green onions. Set aside. 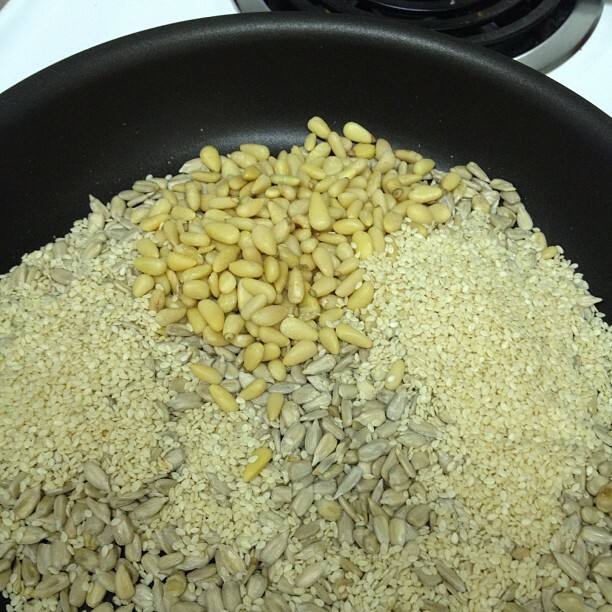 Add sunflower seeds, pine nuts, sesame seeds, and almonds to a large skilled on low-medium heat and toast for 3-5 minutes, stirring often. Once the topping is toasted, add it to the large bowl filled with broccoli slaw and green onions. Give the dressing one more whisk and evenly distribute over the salad. Toss with tongs or spatula until everything is combined. If you are not eating this right away, leave 'salad', 'the crunch', and 'dressing' in separate containers - until 20 minutes prior to serving.